In a game, where the scoreline swung from one team to the other, Qrendi Falcons’ energetic ball-in-hand game finally won over a battling Kavallieri side. From the moment referee Lionel da Silva blew his whistle, Falcons went on the attack, running all penalties and from all over the field, stretching the Kavallieri defence. Within the first five minutes Falcons got the breakthrough from a quick tap penalty, Aaron Borg scoring an unconverted try in the corner. Falcons were trying to run from everywhere but some dropped passes and a Kavallieri drift defence stemmed their flow of play. From a mistake at the Falcons back, full-back Dalton swooped and intercepted the ball to score an unconverted try under the posts, making the score five-all. Joe Cutajar kicked long into the corner, putting Kavallieri into an ideal attacking position. The catch and drive faltered but they won a scrum, Cutajar ran and Doublesin, going down the blindside, scored out wide. With a great kick from the touchline, Cutajar converted to put Kavallieri 12-5 in front. A Doublesin kick put the ball into Bartolo’s hands but a head-high tackle stopped his progress to the line. The penalty created a Kavallieri line-out in the corner which was stolen by Falcons who ran it back downfield with Ryan Borg putting a grubber kick through. He gathered the ball and scored an unconverted try. From kick-off, Kavallieri won a penalty. Cutajar kicked for the corner and from the line-out the forward pack drove Desira over for a converted try. Kavallieri were now 19-10 ahead. But from a quick Kawara throw-in, Aaron Borg scored with a great fend-off on the last tackler. Andrea Galea converted and the half-time score stood at 19-17. Falcons lifted their game in the second half and Julian Galea broke down the right to score in the corner. The try was converted. Kavallieri had to hold on to the ball and take the sting out of the Falcons’ attack, which they did with some pick and goes in the forwards as big Samuel Zammit carried strong. They released their backs for Thomas Aquilina to break the defence and he scored out wide to draw the teams level on 24-all. The energetic Falcons attacked again, forcing Kavallieri into mistakes behind their tryline. A five-metre scrum and a few hit-ups was followed with a Halliday try under the posts. From a scrum, Julian Galea ran blind, the Kavallieri defence held off, thinking he was going to pass, but he kept running to score, which he converted. It was now 38-24 for Falcons. But Kavallieri weren’t finished just yet and a head-high tackle gave them a penalty, which they drilled into the corner. A catch and drive had Cutajar scoring an unconverted try. But, a long Kavallieri defensive kick was run back at them with a long pass to Andrea Galea. He worked the ball to Aaron Borg who scored wide out – 43-29. Kavallieri put pressure on their opponents’ line-out. From a maul Brenton Bonello crashed over to score and finish a lively match. 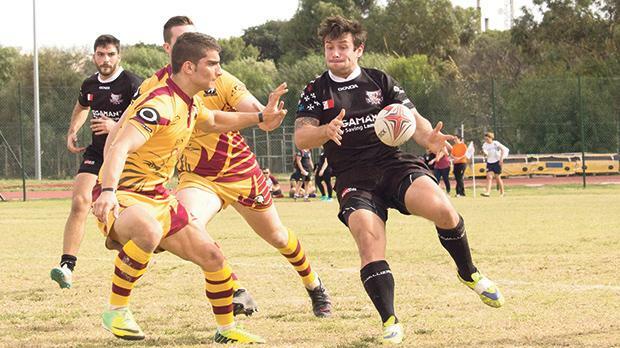 Julian Galea (Qrendi Falcons) and Thomas Aquilina (Kavallieri).